Best way to celebrate your 90th? Bang & Olufsen has been around for 90 years now, creating both amazing sound, and drop-dead-gorgeous speakers. The new BeoLab 90 is the company's newest creation, using state-of-the-art engineering to cater for the mostuncompromising sound enthusiast. 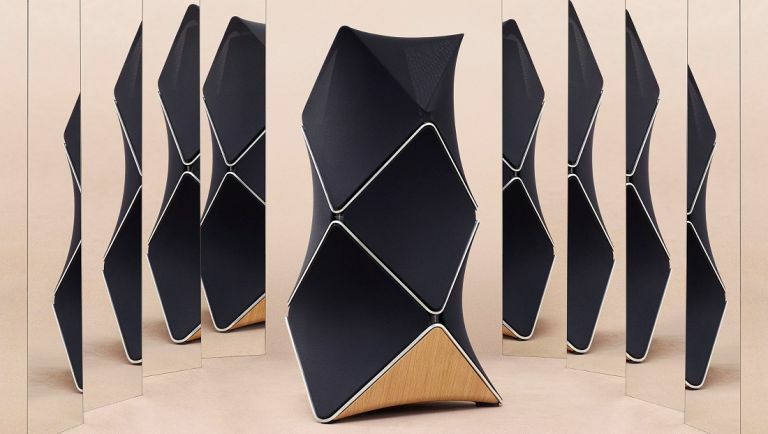 Bang & Olufsen thinks the BeoLab 90 may well be the most powerful digital loudspeaker ever designed for use in the home. It's not a case of power over sound quality either, with the company introducing a number of unique technologies to ensure your audio sounds top notch. This includes active room compensation, beam width control, and beam direction control. Active room compensation calibrates the audio coming from the speaker to the shape of your room, position of furniture, and location of the listener. Beam width and direction control allow you to change the sound beam depending on the situation, for example, are you listening solo, or do you want to fill the room with sound at a house party? Everything is catered for. The 360-degree design is based on a complex aluminium cabinet which weights 65 kg. The speaker is finished in a black fabric cover and curved wooden base. "BeoLab 90 is our most complete loudspeaker to date. It is a committed investment in excellent craftsmanship, ideal materials and superior technology. Future Bang & Olufsen products will benefit from the innovation and know-how gained from the development of BeoLab 90 – and our customers will savour in perfect sound from the ultimate loudspeaker for their home,” says Bang & Olufsen CEO, Tue Mantoni. The BeoLab 90 will be available in select stores from November 17, priced at £26,995 per unit (and £53,990 for the pair). Funds can't quite stretch to 54 grand? Why not celebrate Bang & Olufsen's 90th anniversary by buying The Art of the Impossible - The Bang & Olufsen Design Story, which gives an exclusive, behind-the-scenes insight to the brand. Has there ever been a better time to remortgage the house to buy a pair of high-end loudspeakers?